Freedom Rockz: Yes Please! Free Butterfinger yummo My Fav! Yes Please! Free Butterfinger yummo My Fav! 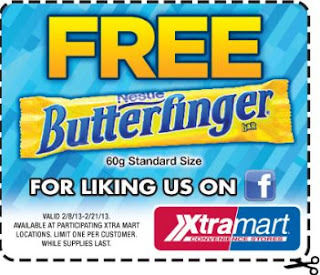 Like them on Facebook to get the coupon for a free Butterfinger. Take your coupon to your local Xtra Mart to redeem. Coupon exp. 02/21/13. Check your store locations.